A year ago Inagro gave itselves the assignment upscale the cultivation of black soldier flies to a semi-industrial level. The cultivation of the larvae proceeds controlled and standardized in the meantime. But in the reproduction of flies and the production of eggs the shoe pinches. The egg production was too unpredictable, and - to Inagro’s requirements - also too low. The time had come to assess the method critically. The concept of the breeding cages is refreshed and the first flights are very promising. The approach for the old breeding nets was characterized by simplicity and efficiency. The net was attached to the ceiling by using magnets and the bottom of the net was simply the floor of the grow room. 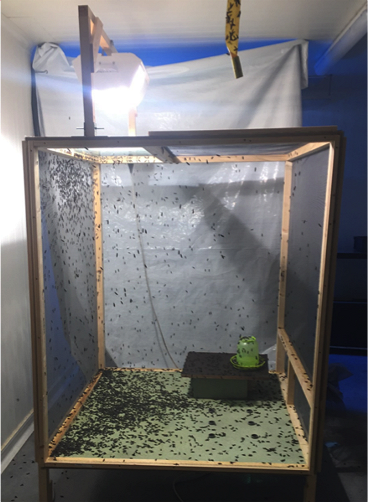 Boxes with pupae (the future fly) were placed on the floor and an opening in the net led to the so-called incubator. A bowl with decaying matter under the net lured the fly to the incubator. On top of the net blocks with slits were equipped for the flies to lay their eggs. Through a drawer we could simply harvest the eggs from the incubator. At the end of a grow round the net could just be removed and washed. The floor was cleaned and the climatic chamber was ready for a new breeding round. A lot of larvae were produced in this way, but it was time to review the system, because the yield continued to decline steadily.. In the new design three things were thoroughly revised. An important realization is the smaller volume of the nets. The new nets now have a volume of only 1.5 m³. So we can now be much more efficient with the available place in the climatic chamber. There is room for eight breeding cages instead of two. In addition, we stepped away from the idea of the external incubator. The stink dish hangs now under the breeding cage. The discard place for the fly is now in the net in a overshadowed discard booth. Through a "sleeve" we can go in the net to harvest the eggs. By inserting the discard place in the net, the cage stays more compact. For a shaded platform was chosen as literature shows that flies avoid direct light when they proceed to oviposition. 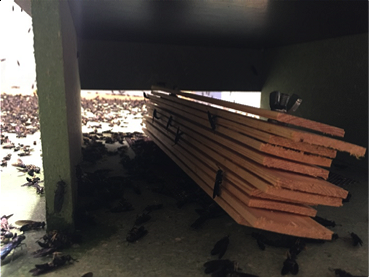 The last large adjustment made is the displacement of the boxes with pupae from the net. These boxes are now placed under the bottom plate of the new net. Flies are strongly attracted to light, making them crawl through tubes spontaneously from the boxes. 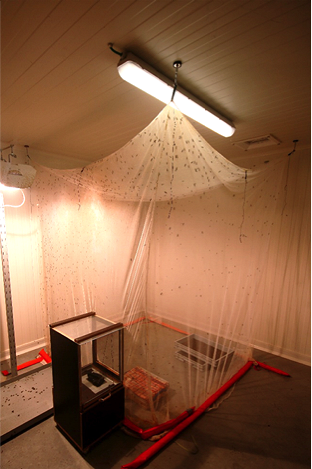 The boxes with pupae in the net were often an attractive place for the flies to lay their eggs randomly. In the smaller nets the smell of the stink dish is dominate, which makes them hardly go to the boxes with pupae. The results seem very promising. No doubt adjustments have to be made in the new design, but it is already a step in the right direction.